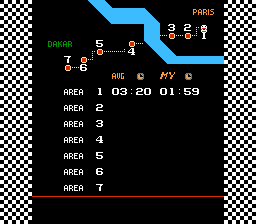 Romhacking.net - Translations - Paris-Dakar Rally Special! Paris-Dakar Rally Special! 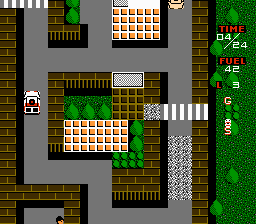 is a racing game for the Nintendo Entertainment System. Here is a full English translation for Paris-Dakar Rally Special. All the dialogue and basic menus are know readable and the game can be fully enjoyed. 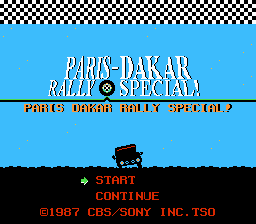 Paris-Dakar Rally Special is a rally racing game developed by ISCO for the Famicom and published by CBS Sony Group in Japan on February 1, 1988. It is an imaginative racing game with platformer and action-adventure elements. It features Dakar Rally cars that could fire bullets, a driver with the ability to exit the car and go exploring to lower a bridge or bypass other obstacles, underwater driving sections, and at times having avoid a fleet of tanks and fighter jets. 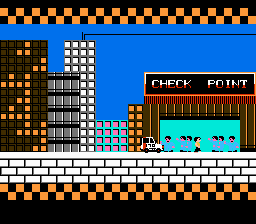 Each stage features its own unique twist. Here is a demo video from YouTube. THE LAST PATCH CONTAINED A CRITICAL ERROR IN GAME PLAY. THIS NEW PATCH FIXED THAT ISSUE. MAKE SURE YOU HAVE VERSION 1.01. V1.02 Fixes menu choice list.